Maya was born into a society where racial discrimination was a norm and it was not unnatural to see a black man undergoing torture at the hands of his 'superior' white counterparts. Black children mocked Maya when she was a child, saying she was ugly. Considering the way she was insulted and mocked by those that were the same skin colour as her, Maya was more of an outcast; she felt less than the other black girls, and could not attain the societal standards of the white girls. When Maya was eight, her grandmother's boyfriend raped her. Maya testified against him in court and later heard he had been murdered. Maya felt guilty and hated herself for being raped and for testifying against the perpetrator. She felt her words could hurt and kill so she became a recluse that refused to speak to anyone, including her family. Maya went to live with her grandmother who loved her so much and nurtured her. In spite of all the nurture and care, Maya refused to speak for years. Maya's grandmother had a neighbour who gave Maya books and poems to read. With the help of her grandmother's neighbour and her grandmother's love, Maya began to speak again. At the age of 14, Maya dropped out of high school and returned at 17. She became pregnant and hid it from her family for as long as she could. In the end, she had a son she could barely support financially. Maya found herself thrown into the unrespectable profession of a stripper, and became a member of a prostitution house in order to provide for her son. When the shame of being a stripper started to hit hard, Maya began to sing in night clubs. This led her to meet accomplished people that stopped over for drinks and to chat about the day's events. Through them, she met Nelson Mandela, Martin Luther King Jr. and so many other accomplished people. Everytime I feel like playing a victim of circumstance, I recall Maya's story amd ask myself "Demi, what is your excuse?" Everytime I am about to complain about how tough I've had it, I ask again "What is my excuse? Do I have a right to complain?" Maya Angelou had a tough life, she fought battles that could cause any of us to faint and fall...and she did faint and fall. She made decisions she probably wasn't proud of but at the end of it all, she came out as a diamond, shiny and bright. She carried her scars and showed the world that life is not high enough to bury any of us. No matter what you are going through, know that God is with you and at the end of it all, you'll be shiny and bright. 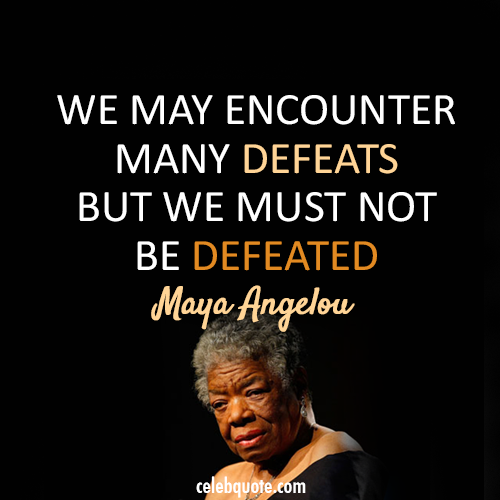 Rest In Peace Maya Angelou. You are a legendary star the world will never forget! Sleep on in the arms of God. Labels: facts about Maya Angelou, life's battles, life's lessons, overcoming defeat.